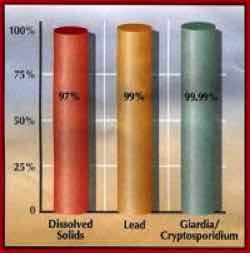 We believe that the mineral salts in tap water are of little use, having been mixed up with the wide variety of pollutants now found in water supplies. However, a special mineral cartridge may be added into the system to ‘energise’ the water and introduce a trace amount of colloidal minerals into the purified water and or ensure Balance PH. Reverse Osmosis, Rejection Rate Chart. Removing impurities with Reverse Osmosis. Independent medical advisers in the United Kingdom tell us that minerals that we need can not be found in a balanced and wholesome form in the water we drink from the tap. A naturally occurring mineral in water is calcium carbonate (CaCo2) which, if present in large quantities, will fur up your arteries as well as your kettle. The Diamond Spring RO.2 system can produce 50 litres of pure water each day, more than enough for the average family. Other models produce more - and systems can be made to order that will produce up to 120 gallons or on demand water. 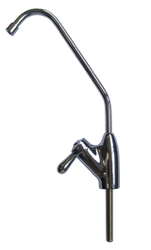 The undersink system measures just 45 cm high, 33cm wide and 13cm deep. It will fit into most undersink or other kitchen cabinets without difficulty. The reservoir is 45cm high and 28cm diameter. Electricity is not usually needed, unless the mains pressure is particularly low. Then a special booster pump is required and a power supply must then be used. The system has an 'auto shut valve', This is a pressure activated control valve that ensures the plant is automatically shut off when the reservoir is full. It also has a 'flush valve’. 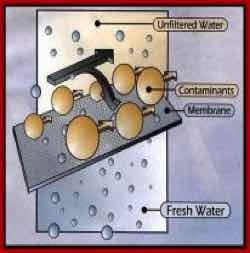 This is periodically opened to flush away any accumulated deposits and debris from the membrane. The only running costs arise from the replacement of the 2 / 3 filters every six months. The reverse osmosis membrane will last approximately 4/6 years (more frequently if the feed water is of exceptionally poor quality. However our systems can be configured to safe guard the membrane with additional carbon and sediment filters. With the Reverse Osmosis (RO) method, all but about 5-10% of pollutants, (dependant on the type of membrane used and other parameters) even those that are dissolved in solution are extracted by the membrane and passed to the household drainage system. R.O. systems, using no chemicals or additives, produce clear polished water that tastes light and pleasant. However in the process of removing the dissolved solids with any R.O. membrane system, the pH of the product water can lower and become more acidic. In the Diamond Spring R.O. system, a special pH balancing media may be used to overcome this problem. Its main purpose is to ensure that your purified water is pleasant to taste.